This poster has more pot in it than the entire movie. Photos courtesy Lionsgate. American Ultra has two major problems — it’s completely tone deaf, and the lead is one of the most sloppily written characters of the year. That lead, Mike Howell (Jesse Eisenberg), is a stoner living with his girlfriend, Phoebe Larson (Kristen Stewart), who works at a gas station and generally has nothing going on in his life. However, unbeknownst to him, he was trained as a sleeper agent by the CIA, and when he tries to go to Hawaii, young higher up Adrian Yates (Topher Grace) targets him for elimination. When Victoria Lasseter (Connie Britton), the agent in charge of his training program, learns of this, she activates him, setting him up for a carnage-filled romp through his sleepy West Virginia town. We go from Howell giving up after a long night of being attacked, to another action scene, to this cute nervous moment that’s supposed to be funny — it’s just impossible to get any kind of feel on this movie. It’s got no idea what it wants to be. Basically, this movie is an hour and a half of not knowing whether or not you’re supposed to laugh, and not in the good Tarantino-y way. The trailers established a stoner comedy, but the film itself is no such thing. All indications from American Ultra itself is that it will be a serious movie with a lot of elements that could be funny if played another way. In the first scenes, we get a she’s-too-good-for-me narration, panic attacks and office power struggles, none of it funny, none of it even stoner-oriented. Howell smokes a lot, we’re told, he doesn’t do it much onscreen, and he’s stone sober most of the movie. He isn’t even a stoner by nature — it’s more a function of his panic attacks. The parade of really serious things continues with the film’s gore, which, again, isn’t the funny Tarantino kind. Howell’s shirt gets drenched in blood when he smashes an attacker’s head in, with the deed itself done offscreen and in a dark room, so we don’t see the goofy hose of blood splash up on him, just a grim reminder through the rest of the movie. In the climactic scene he’s stabbed and seems to begin to pass out from blood loss. Howell also does a lot of puking, which is often played for grossout comedy in other movies, but here it’s always in a “I’m having a debilitating panic attack” or “I’ve just breathed deadly poison” context. They don’t even show the vomit, which is the most basic requirement to play it off as funny. Despite most elements clearly being serious, there are plenty of moments where it feels like viewers are meant to laugh, like when someone calls Lasseter a monkey fucker — that was the information released via news stations to have residents call in her’s or Howell’s location — or Laugher’s (Walton Goggins) scenes. One of Yates’ agents sent to take Howell down, Laugher has his four front teeth kicked in during their first encounter — not cleanly though, they’re broken off in half. He’ll later show them to Yates in the kind of grossout gag the film steers clear of at other opportunities, and through the rest of the movie he’ll speak in a mongoloid, my-mouth-has-been-recently-mutilated voice that, again, I still don’t know if it’s funny or not. Then he’ll have the stock they-stole-both-our-lives bro-bonding scene with Howell, a scene that can still be powerful if played correctly, still speaking in said mongo voice. American Ultra has two distorted reality montages, one when Howell is being activated and the other a poison dream. They’re both interesting, but last about twice as long as it takes for them to get boring. American Ultra sets up two parallel storylines — one about a deadbeat stoner proposing to his girlfriend, and the other about a petty CIA power struggle causing bad things to happen to real people. Both of these storylines rely on viewers caring about Howell as a protagonist, but the movie takes every shortcut in the book when building his character so that’s pretty much impossible. The only word to describe pre-activation Howell is timid. He has no goals and no other real characteristics. Even his substance use seems to be a function of this quality. However, we are told by his girlfriend that he’s the kindest, gentlest person she’s ever met, and the sheriff talks about how he’s in jail so often they’re going to get him a toothbrush, which doesn’t make even a little bit of sense. He’s too cowardly to be in there for any kind of violent crime or theft, and if you go to jail that often for possession you get a toothbrush from the federal prison where you’ll be spending the rest of your life. This information doesn’t fit at all with the character’s words and actions, and it takes the irony out of him becoming a violent badass. We later learn that his memory was wiped during his training, but this is apparently something that he doesn’t think about and isn’t important to him. This character has more informed traits than actual ones, and it comes through in how empty the movie feels. Both plotlines require a strong protagonist to work, and Howell isn’t one at all. 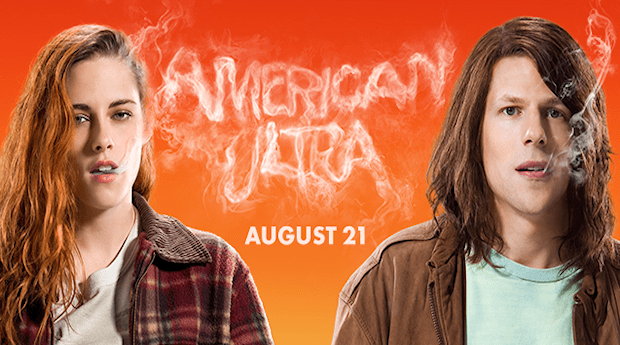 American Ultra will go into wide release Aug. 21. Leopold Knopp is a formerly professional film critic, licensed massage therapist and journalism student at the University of North Texas. I bark at dogs. I’ve had a change of heart about reader input. It is now welcomed and encouraged. Like Reel Entropy on Facebook, follow it on Twitter @reelentropy, and shoot questions to reelentropy@gmail.com. This entry was posted in Entropy and tagged #adventureland, #american horror story, #american ultra, #burn after reading, #connie britton, #Dawn of Justice, #jesse eisenberg, #justice league, #kristen stewart, #lionsgate, #that 70's show, #the big lebowski, #topher grace, #twilight. Bookmark the permalink.